Author(s): Santosh Kumar Bharti, Raja Roy. Division of Cancer Imaging, Research, Russell H. Morgan Department of Radiology & Radiological Science, School of Medicine, Johns Hopkins University, Baltimore, MD- 21205, USA. To achieve goals in metabolomics investigations, it is necessary to produce a comprehensive metabolic profiling from biological samples. Identification of metabolites is one of the important steps in metabolomics studies and the conclusion drawn from such studies depends on how exactly the metabolites are identified. NMR is one of the most selective analytical techniques which offers structural information of molecules. But, due to complex biological sample matrix, metabolic identification step needs application of advanced NMR techniques and analytical strategies for better accuracy. This review covers the analytical methods and strategies used for identification of metabolites in NMR-based metabolomics. The specific problems and troubleshoots associated with identification of metabolites in biological samples are discussed in details. Keywords: NMR spectroscopy, spiking, metabolomics, metabolites assignments, COSY, HSQC. Affiliation:Division of Cancer Imaging, Research, Russell H. Morgan Department of Radiology & Radiological Science, School of Medicine, Johns Hopkins University, Baltimore, MD- 21205, USA. Keywords:NMR spectroscopy, spiking, metabolomics, metabolites assignments, COSY, HSQC. Abstract:To achieve goals in metabolomics investigations, it is necessary to produce a comprehensive metabolic profiling from biological samples. Identification of metabolites is one of the important steps in metabolomics studies and the conclusion drawn from such studies depends on how exactly the metabolites are identified. NMR is one of the most selective analytical techniques which offers structural information of molecules. But, due to complex biological sample matrix, metabolic identification step needs application of advanced NMR techniques and analytical strategies for better accuracy. 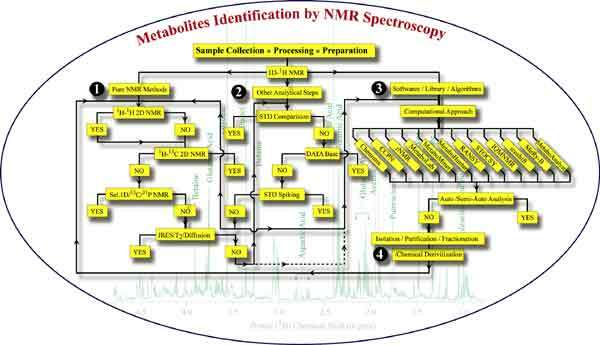 This review covers the analytical methods and strategies used for identification of metabolites in NMR-based metabolomics. The specific problems and troubleshoots associated with identification of metabolites in biological samples are discussed in details.